The definitive guide for picture smocking, this 48-page color booklet is a must for beginning and advanced stacking instruction. 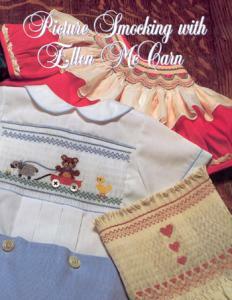 With over 100 step-by-step illustrations & photographs, this volume also contains seven color designs, 12 interchangeable designs, 12 yoke borders and 12 round-neck borders, plus numerous helpful tips. The definitive guide for picture smocking, this 48-page color booklet is a must for beginning and advanced stacking instruction. With over 100 step-by-step illustrations & photographs, this volume also contains seven color designs, 12 interchangeable designs, 12 yoke borders and 12 round-neck borders, plus numerous helpful tips. I have dealt with Allbrands several times in the past and find it one of my favorite companies in all ways. Thanks for your fine service.